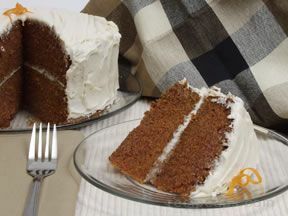 This moist and dense textured carrot cake is loaded with grated carrots and topped with a classic cream cheese frosting. 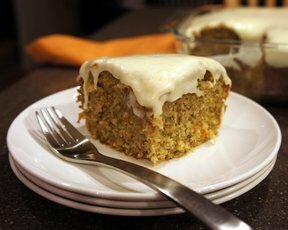 See tips and advice on how to grate carrots for this recipe. Grease and flour pans. Preheat oven to 325Â°F. Combine oil, sugar, and eggs and beat well. Sift the flour, soda, salt, and cinnamon together. Add to the sugar mixture and beat for 2 minutes. Add vanilla and blend well. Stir in grated carrots until evenly distributed. Do not over-stir. Pour into prepared pans. Bake for 45 minutes or until done. Check for doneness by poking with a toothpick. Toothpick should come out clean. 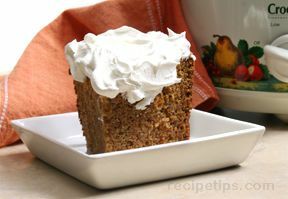 Cream cheese and butter or margarine should be slightly soft, but not too soft. Cream butter or margarine and cream cheese together. Add powdered sugar and vanilla and beat until well blended. Add more powdered sugar if you would like the frosting to be a little thicker. 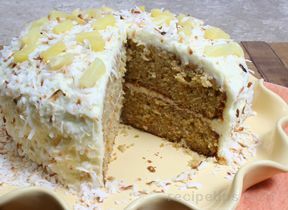 Frost cake when it is completely cooled. Frosting may be stored in the refrigerator 1 to 2 weeks. Remove from refrigerator a little while before using.